If you think all it takes to be a Chicagoan is housing a couple of veggie-laden hot dogs or knife and forking your way through a slice of deep dish, you have a few things to learn. Chicago is home to so many diverse neighborhoods with rich foodways that their food traditions, like drinking punishingly bitter booze or dunking entire beef sandwiches in beef jus, may seem absurd to the uninitiated. While we can’t promise finishing this list will ensure you’re correctly pronouncing “SAH-sage,” you’ll certainly be on the righteous path. Editor's Note: As you read on, you may notice that aforementioned, highly contentious cheese and butter crust bomb is absent from this list, but before you angrily scroll to the comments to air your rage, know this: a lot of locals only eat deep dish when hosting their tourist friends. 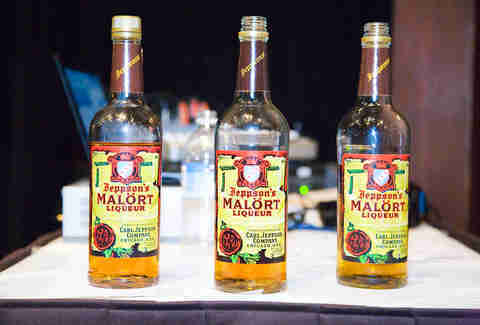 Whether you love to hate it, hate to love it, or refuse to drink it, Jeppson’s Malört is as begrudgingly Chicago as our notoriously bitter winters. Fitting for a wormwood-distilled liqueur whose flavor is most often described as bitter with bitter top notes and a lingering bitter finish. Soften the blow if you must by trying it in a cocktail, or drain it down and embrace the inevitable Malört face to follow. 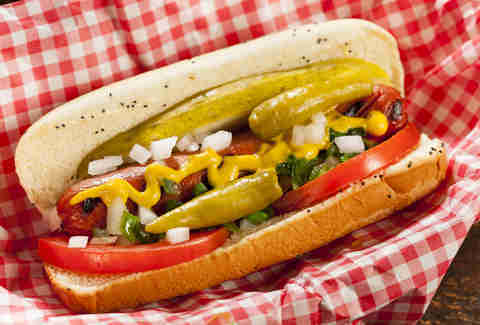 All Chicagoans worth their (celery) salt can probably recite the components of a Chicago-style hot dog in their sleep. 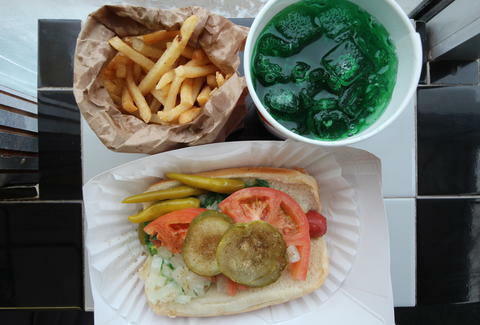 Mustard, onions, tomato, neon-green relish, sport peppers, and celery salt on a poppy-seed bun. And there are plenty of places to get a great one. But another can’t-miss doggy that begets our meatpacking roots is the Depression dog, an all-beef frank piled with mustard, onions, sport peppers, and a handful of hand-cut fries. All you need in life on a bun. You may not be as familiar with this South Side-born pizza style, also known as tavern or pub style. 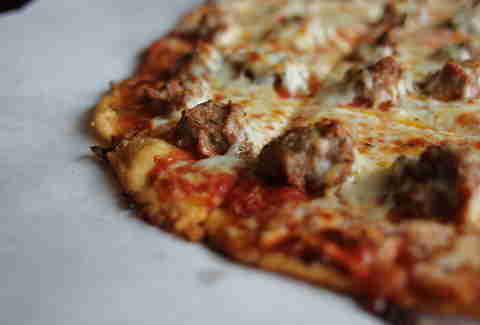 But with its trademark cracker-thin crust and slightly sweeter sauce, traditionally cut into little squares so as not to interfere too much with drinking time, square-cut pizza has a loyal following among many Chicagoans and southwest suburban residents alike. Whether you like yours authentically minimalist -- nuggets of charred steak nestled inside two corn tortillas with onions and cilantro -- or outside the box -- filled with fried chicken, cumin lamb, or Wisconsin cheese and peanuts -- tacos are an essential part of Chicago street-food culture. 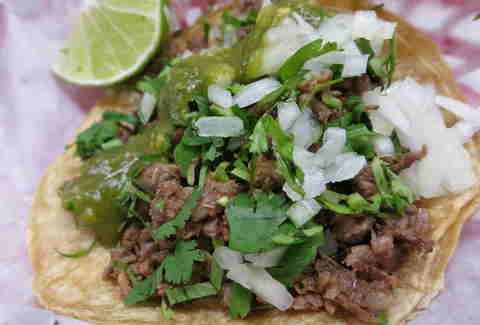 And with abundant options in nearly every hood, you’re always just a CTA ride away from your next favorite taco. Calabria, Italy’s most famous salami is cropping up all over Chicago and beyond, thanks to the father-and-son duo behind ‘Nduja Artisans. Agostino Fiasche and son Antonio make their brick-hued, spicy spreadable salami right here in Chicago (well, technically west suburban Franklin Park) from just four ingredients: pork shoulder and pork fat from Berkshire pigs, dried Calabrian chiles, and chile salt. Once you taste it, you’ll know that’s all it needs. Buy this magical meat paste at retailers all over Chicago (from Mariano’s to Eataly), taste it in dishes at spots like Davanti Enoteca and Coalfire pizza, or get it online. A native Chicagoan and pastry chef for Stephanie Izard, gelato maestro Jessica Oloroso’s famed seasonal shop (with two locations, open April to November) is dedicated to the art of Italian-style ice cream and sorbet. 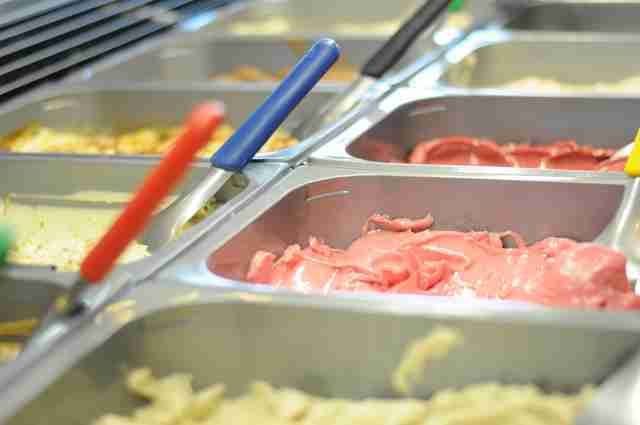 Flavors are as fleeting as they are innovative, with daily changing concoctions like white chocolate banana curry, sesame fig chocolate chip, goat cheese cashew caramel, and raspberry apple cider sorbet. 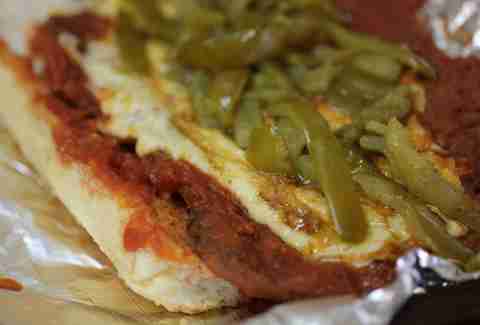 This hefty sandwich, combining thin-pounded, breaded steak, red sauce, melted cheese, and peppers or giardiniera -- is a South Side favorite that often goes under-appreciated. And while Ricobene’s version has gotten the most love from national media, Bridgeport is full of spots turning out a mean breaded steak: Gio’s Cafe and Deli, Kathy De’s Deli, Punky’s Pizza, and Fabulous Freddies Italian Eatery, to name a few. When you live in a place that’s described as having “two seasons: winter and construction,” it’s understandable that Chicagoans make the most of summer. 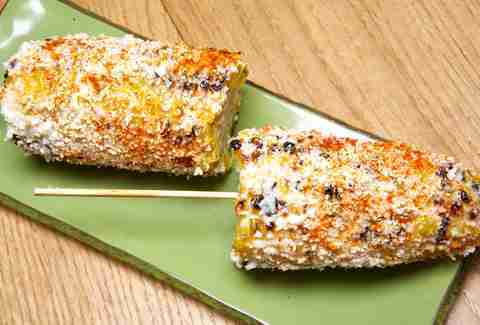 One of the quintessentially short-lived flavors that captures sticky August in Chitown is fresh, local summer corn, which can only be improved when grilled and topped with Chihuahua cheese, chile powder, and a squeeze of lime. Best eaten from a roadside food cart. 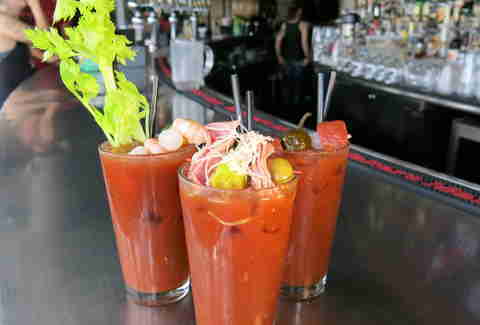 Brunch is something of a tradition around here, mostly because Chicagoans love an excuse to drink early in the day. So it’s unsurprising that one of the drinks synonymous with brunch -- the spicy vodka and tomato juice concoction known as the Bloody Mary -- has become an exercise in one-upmanship when it comes to odd mix-ins and garnishes. Like sherry, tequila, or gin instead of vodka? No problem. Want a raw oyster, slice of cold pizza, or whole hot dog on top? You got it. Just make sure you get a chaser of cheap beer on the side. 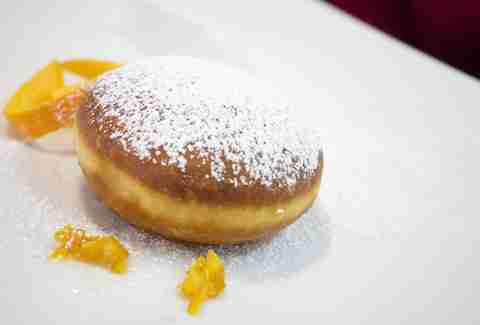 Some places ring in Fat Tuesday each February with booze-soaked parades, but here we just eat a lot of yeasty, round Polish pastries known as paczki (pronounced poonch-key). Traditionally, Paczki Day falls on the Thursday before Fat Tuesday, but plenty of bakeries and donut shops ramp up production leading up to and following the holiday, so you can sample everything from traditional custard- and jelly-filled varieties to boozy or bacony, to burgers with paczki buns. Can you think of a better way to get through February in Chicago? One of the last wood-smoked seafood restaurants in Chicago, nearly 70-year-old Calumet Fisheries is actually more of a shack. But it’s worth a trip down to 95th St to pick up some smoked chubs (call ahead for this limited-availability beaut), pepper- and garlic-smoked trout or smoked shrimp -- brined overnight and smoked on site in a natural oak wood smoke house. 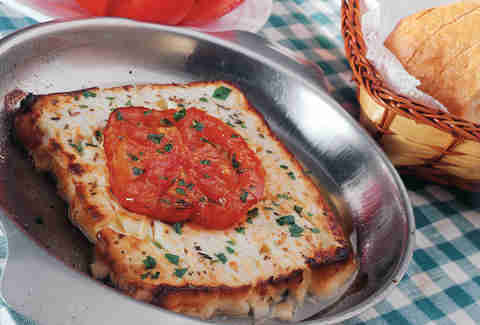 Invented in 1968 at the Parthenon restaurant and now dutifully performed on a nightly basis by pretty much every restaurant in Greektown, there’s nonetheless still some magic in watching a big square of fried cheese get doused in brandy and lit ablaze to the cry of “Opa!” There are plenty of other enticing (and less touristy) reasons to have a meal in Greektown, too, like masterfully grilled octopus and tender lamb and beef meatballs swimming in minty tomato sauce -- not to mention unbeatable prices. When you’re out at a bar and several drinks (and a few bad decisions) in, nothing can right the ship better than a few foil-wrapped, cheese- or fall-apart pork-filled tamales bought from the pub-roving Tamale Guy, also known as Claudio Velez. Track his whereabouts on Twitter @TamaleTracker. Your hungover-self will thank you tomorrow. 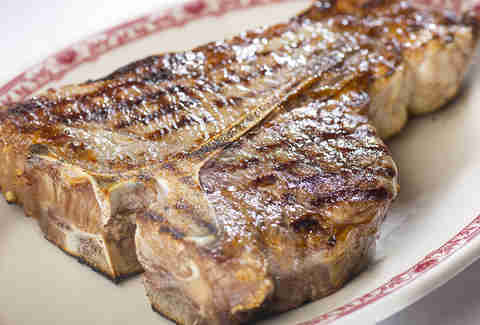 If you’re a meat eater (which by this point in the list we kind of hope you are), it’s hard to come to Chicago and not have a steak. Luckily, steakhouses here are as ubiquitous as disappointed Bears fans. So you can have your white-tablecloth, eye-poppingly priced dry-aged bone-in ribeye experience, your old-school, low-lit, perfectly cooked beef and large stiff cocktails experience, your steak with a side of live music experience, and your denim-clad, butcher-shop-turned-off-color-steakhouse experience -- all within a few gloriously meaty miles. This beguiling stretch of West Rogers Park is home to some of the city’s best Indian and Pakistani eats, not to mention killer food markets. Whether it’s spicy Southern Indian veggie curry at Uru-Swati; rich, creamy butter chicken at Viceroy of India; or dessert pudding at Tahoora Sweets & Bakery, the wealth of choice may seem daunting. Your best bet is to come hungry... and often. It feels a little cheaty to put Garrett’s on a list without deep dish, but the smells that perennially waft up and down Michigan Ave alone justify this pick. 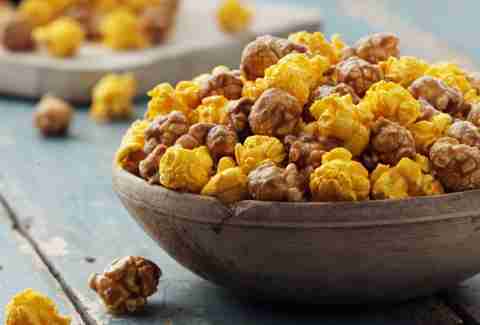 As does the addictingly sweet-and-salty combo of Garrett’s handmade, namesake blend of caramel corn and cheese popcorn. If the aroma doesn’t give you away, your orange fingers will. This classic Chicago sandwich fittingly traces its origins to the Maxwell Street Market in the 1930s. Dueling University Village side-by-side stands Jim’s Original and the Express Grill (which opened later) both lay claim this sandwich, which stars a kielbasa-like, grilled beef and pork sausage that’s unique to Chicago. Ask for da works and you’ll get just two toppings -- yellow mustard and a mound of grilled onions -- plus optional (say yes) pickled sport peppers. These crescent-shaped dumplings have a long history in Chicago, thanks to the city’s sizeable Polish-American population, not to mention the inarguable, comfort food-esque appeal of dough stuffed with sweet and savory things. Traditionally filled with sauerkraut, meat, mushrooms, potato and cheese, or fruit, more adventurous pierogi-makers are cramming them with everything from beef cheeks to Champagne kraut. Yes, we’re well aware that this is the third beef-centric entry, but Chicago is -- at its core -- a meat-loving town. 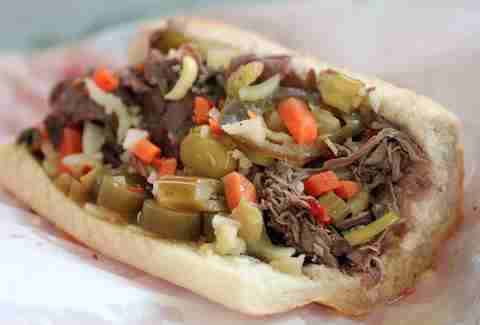 Few things capture our love of red meat than the Italian beef sandwich piled with tender roast beef and giardiniera that’s dunked in (also) beefy, oregano-laced jus. And yes, you want it dunked. Sandwich connoisseurs, take note: should you see the folkloric Italian beef mutation known as the Gym or Jim Shoe -- topped with roast beef, gyro meat, and corned beef -- follow your instincts and order it. A Humboldt Park original, this plantains-for-bread sandwich was invented in 1996 at the now-shuttered Borinquen Restaurant. It’s been copied in countless spots around the city since, and with good reason. Typically steak, chicken, or pork is layered with mayo, cheese, lettuce, and tomato between two smashed green plantain planks that, if fried just right, make for an airy yet sturdy bread substitute. This lime-based soft drink with a hint of lemon has been a Chicago institution since 1919, when Congress passed the 18th Amendment establishing Prohibition. This kelly green-colored stuff of liquid legend was originally made in Pilsen by the Schoenhofen Edelweiss Brewing Company to survive Prohibition. Now manufactured by Redding, CA’s WIT Beverage Company, you can still get this vintage soda at grocery stores all over Chicago -- especially in the six weeks surrounding St. Patrick’s Day, when the other green river gets dyed even greener. Freelance food and drink writer Maggie Hennessy became a Chicagoan when she moved here at age seven and started pretending she didn’t like ketchup on hot dogs anymore.